Ease of use, simplicity, intuitiveness…. Ease of use, simplicity, intuitiveness. Obviously been thought through by sales people. I wish it linked my Meetings into Outlook without having to go through Zapper. Having wasted more than a week trying to set up the supposed leading brand of CRM, you know the one beginning with Sales….., I was recommended to try PipeDrive and although I made a simple error mapping the fields to my spreadsheet the first time, I was still up and running within a couple of hours. Quite amazing! The good thing is that if you make a mistake like I did, you can undo the import immediately! WHAAAT?! Yeah right?! So easy, and self explanatory. I have been using PipeDrive for about 5 months now and am amazed every day that it is so intuitive. Linking email is automatic so that can’t be easier, and I love the reminders for Activities every day, and also being able to easily make notes on calls, and schedule the next action. I did also have cause to ask support a question, and was blown away by the level of support I received instantaneously via the chat, and even after that I got emails with screen shots of the steps I needed to take to do what I wanted. Really impressed. This CRM has been designed by people who actually KNOW what is needed in CRM, not just a random amount of data put together that you have to figure out what to do with. It’s so easy to set up YOUR specific steps in the Pipe, and is so intuitive it’s a wonder someone didn’t do this before! So far I have recommended PipeDrive numerous times within our firm, and will continue to do so. I don’t need to look anywhere else! Thanks PipeDrive! Keep up the great work! Ease of use, simplicity, intuitiveness. Obviously been thought through by sales people. I wish it linked my Meetings into Outlook without having to go through Zapper. Having wasted more than a week trying to set up the supposed leading brand of CRM, you know the one beginning with Sales….., I was recommended to try PipeDrive and although I made a simple error mapping the fields to my spreadsheet the first time, I was still up and running within a couple of hours. Quite amazing! The good thing is that if you make a mistake like I did, you can undo the import immediately! WHAAAT?! Yeah right?! So easy, and self explanatory. I have been using PipeDrive for about 5 months now and am amazed every day that it is so intuitive. Linking email is automatic so that can’t be easier, and I love the reminders for Activities every day, and also being able to easily make notes on calls, and schedule the next action. I did also have cause to ask support a question, and was blown away by the level of support I received instantaneously via the chat, and even after that I got emails with screen shots of the steps I needed to take to do what I wanted. Really impressed. This CRM has been designed by people who actually KNOW what is needed in CRM, not just a random amount of data put together that you have to figure out what to do with. It’s so easy to set up YOUR specific steps in the Pipe, and is so intuitive it’s a wonder someone didn’t do this before! So far I have recommended PipeDrive numerous times within our firm, and will continue to do so. I don’t need to look anywhere else! Thanks PipeDrive! Keep up the great work! The software prompts me to add a new activity (email, meeting, call, etc) after I mark another activity complete. It visually reminds me if there are leads or clients that do not have a next step applied to it. This make a lot of sense to a getting-things-done approach. We do a lot of mobile responsive websites and monthly marketing with a lot of moving pieces, and it’s great to have confidence that we know what is coming next. I sometimes wish there were a calendar view. I also wish I could add screenshots into emails ¿ I find myself having to go back to Google Inbox for this (and bcc-ing the pipedrive email to sync with the contact). I’ve tried a lot of CRMs in the past, and would always end up going back to using basic contact software after inevitably they created more work for me than they helped. Pipeline is the first CRM I’ve used that helps me feel at peace, knowing that each lead has a next step applied to it. I also use a lot of custom pipelines to track recurring customers, contractors, onboarding and large complex projects. The sync with my email and calendar makes it also easy for me to keep all conversations organized, and all meetings in line with appointments booked with Calendly. Since I’m currently managing sales, projects, and 10 contractors, Pipeline helps me keep everything going without anything slipping through the cracks. I couldn’t have scaled my business by 150% this year without Pipeline. It becomes most useful when synced to email. The software prompts me to add a new activity (email, meeting, call, etc) after I mark another activity complete. It visually reminds me if there are leads or clients that do not have a next step applied to it. This make a lot of sense to a getting-things-done approach. We do a lot of mobile responsive websites and monthly marketing with a lot of moving pieces, and it’s great to have confidence that we know what is coming next. I sometimes wish there were a calendar view. I also wish I could add screenshots into emails ¿ I find myself having to go back to Google Inbox for this (and bcc-ing the pipedrive email to sync with the contact). I’ve tried a lot of CRMs in the past, and would always end up going back to using basic contact software after inevitably they created more work for me than they helped. Pipeline is the first CRM I’ve used that helps me feel at peace, knowing that each lead has a next step applied to it. I also use a lot of custom pipelines to track recurring customers, contractors, onboarding and large complex projects. The sync with my email and calendar makes it also easy for me to keep all conversations organized, and all meetings in line with appointments booked with Calendly. Since I’m currently managing sales, projects, and 10 contractors, Pipeline helps me keep everything going without anything slipping through the cracks. I couldn’t have scaled my business by 150% this year without Pipeline. It becomes most useful when synced to email. I’ve been using different CRM myself, and also advised different businesses in choosing the one that would match their expectation. Among others, Pipedrive is the most easy to adopt for any sales department. Both importation and exportation of data make the tool even easier to integrate with existing process step by step. Both sales people and middle management are rapidly noticing how much the solution facilitate the view on either activities, pipes, and statistics for team and individuals. The tool can be customized by non-technical users, and adjusted according to existing processes. Integration with calendar and emails are a matter of minute. The down side is that this CRM is not marketing oriented and might show limits in case of complex sales or huge number of records to synchronize. There is no consistent tool to avoid duplicates, which is annoying when synchronized with other solutions. Thus, tiers application have developed services, but without sufficient protection of data. We’re using Pipedrive to manage all our customer activities (phone-calls, mails, schedules, contact-information, etc.) so that not only sales but all others never loos track of a customer journey. Despite the fact that this tool is almost intuitive you also can easily manage complex customer organizations. It simply reflects nearly all circumstances to record and plan topics when working with customers. An ideal tool for the entire pipeline management where simple drag and drop features help to manage stages of a project. Pipedrive eases the salesman work dramatically! Pros: personally found it quite useful when writing mails to use the option adding an automated bcc customer ID. The result is that you mail appears in your pipeline- and customer-history as well. To set up different pipelines make it easy to also manage different events. The scheduler activity gives you on all devices (PC, Smartphone, etc.) an alert to remind to your planned activities. Mobil access to all pipeline features – a very nice App! All contact data, history etc. at hand when preparing a customer visit or call. Statistical features seems to need rework. – writing an email to a contact of an account organization you need to consider to attach the customer-ID from the deal-level to the bcc-field in the mail in order to have that mail then in the customer history – lost accounts have been moved to a separate pipeline Forget complex and expensive CRM Tools. I’ve seen many of them (see my history in LinkedIn). This is the first one which does what it is supposed for – make the salesman live easy! We’re using Pipedrive to manage all our customer activities (phone-calls, mails, schedules, contact-information, etc.) so that not only sales but all others never loos track of a customer journey. Despite the fact that this tool is almost intuitive you also can easily manage complex customer organizations. It simply reflects nearly all circumstances to record and plan topics when working with customers. An ideal tool for the entire pipeline management where simple drag and drop features help to manage stages of a project. Pipedrive eases the salesman work dramatically! Pros: personally found it quite useful when writing mails to use the option adding an automated bcc customer ID. The result is that you mail appears in your pipeline- and customer-history as well. To set up different pipelines make it easy to also manage different events. The scheduler activity gives you on all devices (PC, Smartphone, etc.) an alert to remind to your planned activities. Mobil access to all pipeline features – a very nice App! All contact data, history etc. at hand when preparing a customer visit or call. Forget complex and expensive CRM Tools. I’ve seen many of them (see my history in LinkedIn). This is the first one which does what it is supposed for – make the salesman live easy! It works! Out operation has had 3 CRMs over the past 6 years and none managed things well for a sales outfit in a construction company. (The damage that causes the agents who sometimes have long timelines in the sales process and referral process is excruciating since no CRM is adapted to offload and download data from another. We like the flexibility of applying to our sales process and keeping track of each prospects stages/activities and not have to adapt to precepts that don’t apply and only get in the way. It really is your CRM. The feedback from Statistics and Analytics is stimulating and encourages one to apply themselves to the system they designed thus developing better business habits which in turn gives better stats and a better view from which management can coach and serve from. It would be nice to be able to review the Activity list page by our Stages. In other words typically cycles are monthly but what is focused on at the beginning of the month is different than what is at the end of the month. For instance at the end of the month you may want to focus just on final stage folks. Another focus somebody might have is they are working a particular area and want to see what else is left on the table while there and arrange schedules accordingly. In other words just being able to organize on the Activities page by city/county can increase efficiency in the field. Your Contacts page has that option but nothing comes up in the columns for anyone. I don’t know if this is a challenge with out set up by our admin. but once we have a the client sold they fall off our radar for the Deals page. We have a few milestones that include us agents which includes pumping clients for referrals and visiting with them on a anniversary date. The only way I can keep them on the radar is to use the Activity page and just label them a Deadline so I can review those by that definition. So all I use Deadline for is follow-up with clients that are purchasing or have purchased. Lastly a small but big ‘thang’, on the client Deals page where we have a pending activity it would be nice to click the pending activity button and the courser lands on a fresh line above the previously typed material so we can just add an update without having to click to front of material, return and arrow up to update. It’s a very repetitive procedure every time you go into an activity. Repeat from above – not sure what you meant by ‘others’, you or somebody looking to add this CRM to their business: It would be nice to be able to review the Activity list page by our Stages. In other words typically cycles are monthly but what is focused on at the beginning of the month is different than what is at the end of the month. For instance at the end of the month you may want to focus just on final stage folks. Another focus somebody might have is if they are working a particular area and want to see what else is left on the table while there and arrange schedules accordingly. In other words just being able to organize on the Activities page by city/county can increase efficiency in the field. Your Contacts page has that option but nothing comes up in the columns for anyone. I don’t know if this is a challenge with our set up by our admin. but once we have a the client sold they fall off our radar for the Deals page, (we aren’t paid until systems are installed and then some… We have a few milestones that us agents which includes pumping clients for referrals and visiting with them on a anniversary date. The only way I can keep them on the radar is to use the Activity page and just label them a Deadline so I can review those by that definition. So all I use Deadline for is follow-up with clients that are purchasing or have purchased. Lastly a small but big ‘thang’, on the client Deals page where we have a pending activity it would be nice to click the pending activity button and the courser lands on a fresh line above the previously typed material so we can just add an update without having to click to front of material, return and arrow up to update. It’s a very repetitive procedure every time you go into an activity. It works! Out operation has had 3 CRMs over the past 6 years and none managed things well for a sales outfit in a construction company. (The damage that causes the agents who sometimes have long timelines in the sales process and referral process is excruciating since no CRM is adapted to offload and download data from another. We like the flexibility of applying to our sales process and keeping track of each prospects stages/activities and not have to adapt to precepts that don’t apply and only get in the way. It really is your CRM. The feedback from Statistics and Analytics is stimulating and encourages one to apply themselves to the system they designed thus developing better business habits which in turn gives better stats and a better view from which management can coach and serve from. It would be nice to be able to review the Activity list page by our Stages. In other words typically cycles are monthly but what is focused on at the beginning of the month is different than what is at the end of the month. For instance at the end of the month you may want to focus just on final stage folks. Another focus somebody might have is they are working a particular area and want to see what else is left on the table while there and arrange schedules accordingly. In other words just being able to organize on the Activities page by city/county can increase efficiency in the field. Your Contacts page has that option but nothing comes up in the columns for anyone. I don’t know if this is a challenge with out set up by our admin. but once we have a the client sold they fall off our radar for the Deals page. We have a few milestones that include us agents which includes pumping clients for referrals and visiting with them on a anniversary date. The only way I can keep them on the radar is to use the Activity page and just label them a Deadline so I can review those by that definition. So all I use Deadline for is follow-up with clients that are purchasing or have purchased. Lastly a small but big ‘thang’, on the client Deals page where we have a pending activity it would be nice to click the pending activity button and the courser lands on a fresh line above the previously typed material so we can just add an update without having to click to front of material, return and arrow up to update. It’s a very repetitive procedure every time you go into an activity. Repeat from above – not sure what you meant by ‘others’, you or somebody looking to add this CRM to their business: It would be nice to be able to review the Activity list page by our Stages. In other words typically cycles are monthly but what is focused on at the beginning of the month is different than what is at the end of the month. For instance at the end of the month you may want to focus just on final stage folks. Another focus somebody might have is if they are working a particular area and want to see what else is left on the table while there and arrange schedules accordingly. In other words just being able to organize on the Activities page by city/county can increase efficiency in the field. Your Contacts page has that option but nothing comes up in the columns for anyone. I don’t know if this is a challenge with our set up by our admin. but once we have a the client sold they fall off our radar for the Deals page, (we aren’t paid until systems are installed and then some… We have a few milestones that us agents which includes pumping clients for referrals and visiting with them on a anniversary date. The only way I can keep them on the radar is to use the Activity page and just label them a Deadline so I can review those by that definition. So all I use Deadline for is follow-up with clients that are purchasing or have purchased. Lastly a small but big ‘thang’, on the client Deals page where we have a pending activity it would be nice to click the pending activity button and the courser lands on a fresh line above the previously typed material so we can just add an update without having to click to front of material, return and arrow up to update. It’s a very repetitive procedure every time you go into an activity. In 2011, Pipedrive joined AngelPad, a startup incubator located in San Francisco. As of 2016, Pipedrive serves over 30,000 companies worldwide, and has raised over $14.2 million in seed funding from various venture capital firms. Currently, Timo Rein and Dominic Butera serve as co-CEOs. Pipedrive offers month-to-month and annual subscriptions. Prices are available on their site in both US dollars and Euros. Pipedrive is a capable sales CRM with contact, deal and activity management tools. Like many similar platforms, Pipedrive provides a visual sales pipeline with a drag-and-drop interface. Users are able to create multiple pipelines with customized stages – custom number of stages, custom names, the option to indicate whether a deal is “rotting” or not. Users can define goals over pipelines per user and import data from a wide number of others CRMs or from a CSV or XLS file. Pipedrive’s mid-tier plan provides two-way email integration – a highly useful feature removing the need to manually attach an email logging string to the BCC field of external correspondence to include it into the CRM (which Silver plan users must do). Logged emails are automatically attached to relevant contacts, organizations and deals. 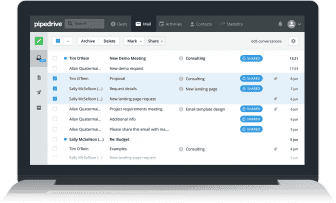 Contact, Organization and Deal profile pages show an activity timeline with the ability to update details, take notes, add activities, send emails or upload files. 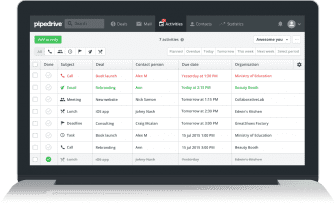 If your company requires call logging and tracking, you are out of luck; Pipedrive doesn’t currently offer call integration, whether out of the box or through third party applications. Pipeline does offer pipeline statistics over time periods (both built-in and custom), user activity reports, as well as visual reports on the numbers of deals, value of deals, deals by pipeline stage as well as a variety of filters. It also includes a live dashboard of deal activity. These are all available on the lower tier (Silver) plan; the Gold plan introduces two-way email sync and increases cloud storage per user. The Platinum plan introduces phone support, dedicated hosting and significantly increased storage per user (from 5GB to 100GB) while advanced user management tools expected in a rollout soon. Pipedrive doesn’t offer many native integrations with third party applications out of the box. It integrates with Google Apps, Google Maps, MailChimp, Trello, Yesware and Zapier. Pipedrive also doesn’t offer internal, logic-based automations, but its Zapier integration can accomplish quite a bit along with the use of webhooks. 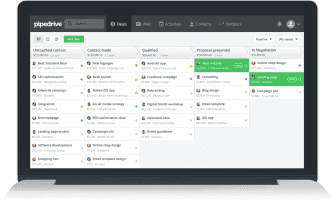 Pipedrive offers a clean user interface, intuitive controls and a carefully curated list of features that provide essential contact, deal and activity management while avoiding the bloat of an over-featured platform. 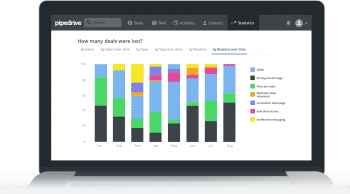 Their mid-tier plan ($21 per user/month, billed annually) is quite affordable for such a clean design, so if you don’t require certain functions – notably call logging – Pipedrive offers a useful platform to manage sales activity and track agent performance. It’s a well-designed application without a ton of features, but it’s good at what it does and it won’t break the bank. If that fits your needs, it’s definitely worth a free trial. What Do You Think of Pipedrive?